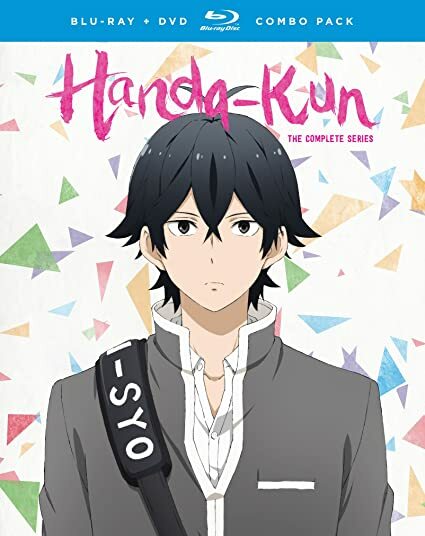 Handa-Kun: Complete Series - BUY THIS BLU-RAY! The frustrated calligrapher from Barakamon is in for a high school throwback! This playful prequel reveals Handa’s incredibly introverted teenage years that made him who he is today. Everybody loves Sei Handa, the handsome calligrapher genius who can do no wrong. Girls adore him, guys respect him, and anyone who is anyone has at least heard his name. The only person who doesn’t know of his popularity is…Handa himself! Wallowing in his insecurities, he assumes people talk about him because they hate his guts. A childhood friend, Kawafuji, could tell him the truth, but it’s way more fun to just sit back and laugh as Handa makes the worst out of every situation. THEN SEND IN A COMMENT ABOUT YOUR FAVORITE FUNIMATION TITLE (you may click on artwork above for a refresher) PLUS YOUR NAME AND ADDRESS TO contests@efilmcritic.com or WeLoveHBS@aol.com. (Just one e-mail please.) Put [b]"EVERYBODY LOVES SEI HANDA" in the subject line and cross your fingers. We will draw names and one of the prizes could be yours. Only 1 entry per household.